When Dr. Nicholas LaRusso arrived at Mayo Clinic for a three-month elective during his fourth year of medical school, he knew where he wanted to be. “Mayo Clinic was like the Emerald City. 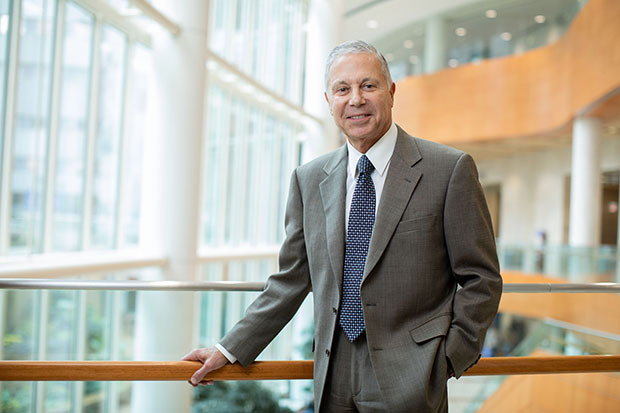 While I loved my training in New York where I worked at one of the three major public hospitals in Manhattan, and where I became a competent and confident physician at that stage of my career, I had never seen anything like Mayo Clinic,” Dr. LaRusso said. After finishing medical school, he returned to Mayo Clinic for his internal medicine training and performed gastroenterology research in the laboratory of Dr. Alan Hofmann. It was at the urging of Dr. Hofmann that Dr. LaRusso became a Mayo Foundation Scholar in the laboratory of the Noble Laureate, Christian de Duve, in the Department of Biochemical Cytology at the Rockefeller University in New York. After two exciting years in this outstanding environment, he joined the Division of Gastroenterology and Hepatology at Mayo Clinic and established his own laboratory. “Mayo Clinic is a place where medical authorities exist for just about every disease, and, at that time in our Division, there weren’t a lot of liver diseases that someone hadn’t already become an expert in. Fortunately, no one was interested in what at the time was an obscure disease called Primary Sclerosing Cholangitis (PSC), so, working with Dr. Russ Wiesner, at that time a bright, young GI fellow, we decided to study PSC.” Beginning in the early 1980s, Dr. LaRusso’s clinical focus, and increasingly his laboratory focus, has been PSC. The major focus of one of his research grants from the National Institutes of Health focuses on cellular senescence, a process where cells stop proliferating but they start secreting many substances that somehow appear to contribute to disease progression. The main cells in the liver that are affected by cellular senescence are the cholangiocytes, the epithelial cells that line the bile ducts. These cells are involved in a group of diseases, including PSC, called the cholangiopathies. “By using novel technologies that we and others have developed, we can test specific hypotheses about what damages these cells, and what are the molecules involved, ultimately with the hope that, by testing some of these hypotheses in PSC, we can come up with a new form of treatment,” he explained. The other major focus of Dr. LaRusso’s research is exploring the intestinal microbiome in animal models of PSC. The idea is that these microbes somehow contribute to disease progression. A highlight of his research: Creating and testing new ideas and technologies with his colleagues, Dr. Gregory Gores and Dr. Konstantinos Lazaridis, both of whom were fellows in his laboratory and Mayo Foundation Scholars. The trio meets at least once a week to brainstorm about PSC research and how to help patients with this disease.